When you think of foods that benefit from deep frying, what springs to mind? But before all those came doughnuts! 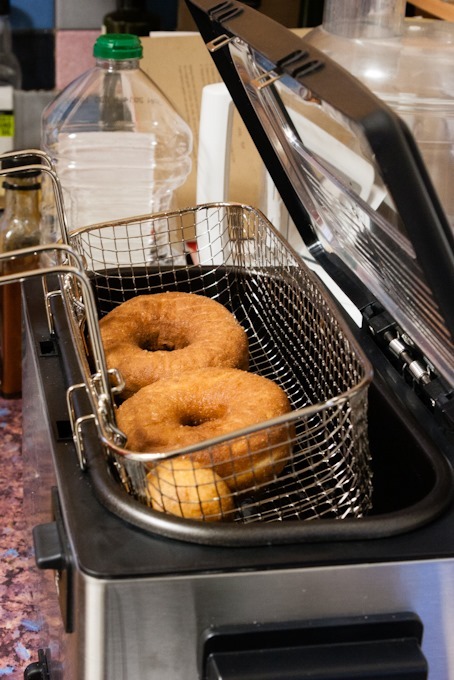 So when we were sent a Judge Cookware Multi Basket deep fat fryer to review (coming soon), the very first thing we made just had to be doughnuts. With a pile of cookery books also awaiting review, we flicked through Pure Vanilla by Shauna Sever and chose her Glazed Vanilla Bean Doughnuts recipe to try. 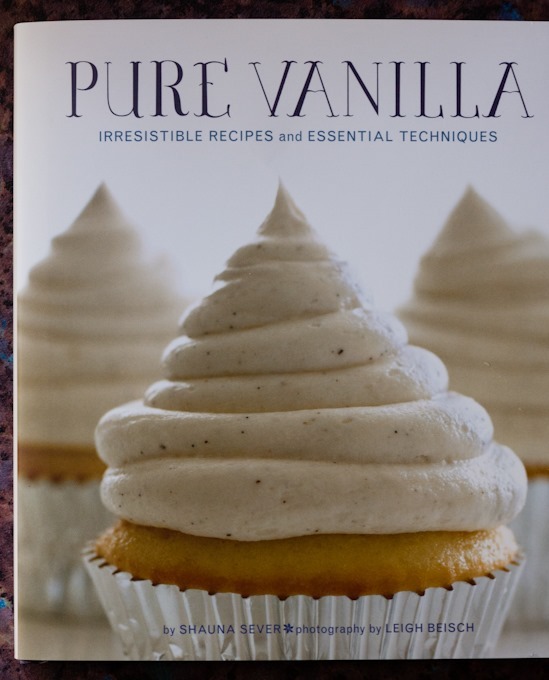 Published by Quirk Books, a young American publishing company based in Philadelphia, Pure Vanilla has been written primarily for the US market, which means you’ll need to make a little effort to translate aspects of the recipes. Fahrenheit cooking temperatures and cup measurements are easy as conversion charts are handily provided inside the back cover. You’ll also need to parse ingredients such as all-purpose flour, confectioners’ sugar, heavy cream and sticks of butter, but in the era of Google, that’s not too onerous. 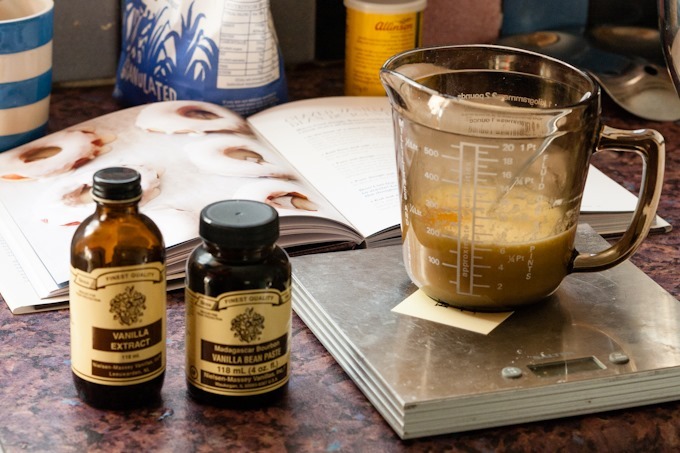 Often, single ingredient cookery books can be a little too gimmicky, adding the chosen ingredient to recipes in which it doesn’t really belong or contribute much just to shoe-horn them into the book. But I really like the kind of recipes Sever has included in her collection – I’m drawn to Light, Crisp Vanilla Waffles, Vanilla Cloud Cake, Tres Leches Cake, Vanilla Snaps, Vanilla Biscotti, Vanilla Bean Marshmallows and Vanilla Mojito, amongst others. 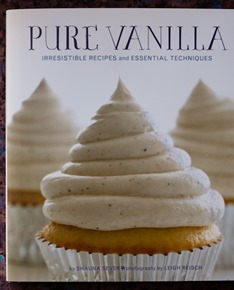 There are some weaknesses with the book too: the index is truly appalling – it lists over a third of the recipes under “vanilla”, which is surely a given in every single recipe in the book and should have been excluded! Not all recipes have accompanying photographs, which is a shame as those which do instantly appeal more strongly. The recipe we made was straightforward to follow and came out beautifully. The colour of our finished doughnuts appeared a touch dark, and we worried we’d overcooked them but they were perfect in both taste and texture, with a light and fluffy interior and a perfectly judged vanilla flavour – it came through clearly, made a definite contribution but didn’t overwhelm. As we made half the amounts given, I’m sharing the amounts we used rather than those in the original recipe. Note: Vanilla bean paste is a thick paste full of actual vanilla seeds and is a great alternative to scraping a real vanilla pod. I used Nielsen-Massey’s paste, which I think is excellent. If you can’t find this product, either use the seeds from a quarter of a vanilla pod or an extra teaspoon of extract instead. 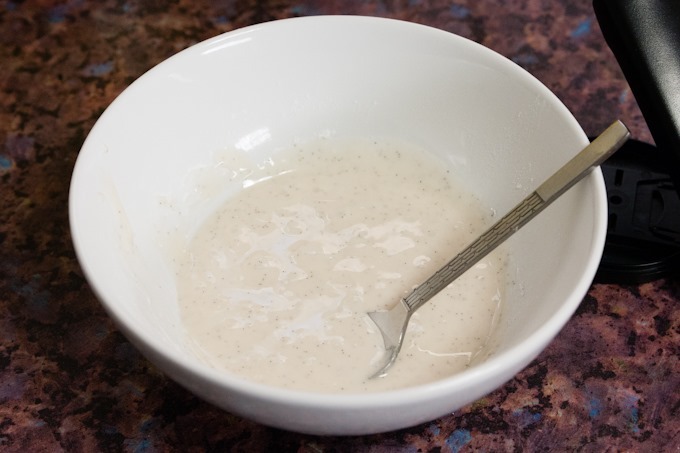 In the bowl of a stand mixer, whisk together yeast, warm water and one teaspoon of the granulated sugar. Leave to stand until it foams, about 5 minutes. Using the paddle attachment on the mixer, at low speed, mix in the remaining granulated sugar, milk, vanilla extract, vanilla bean paste, egg yolks and butter. Add the flour and salt and mix for a further 3 minutes, occasionally scraping down the sides of the bowl and the paddle. 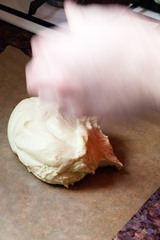 Turn out the dough onto a floured work surface and knead by hand, briefly, dusting with flour if you need to. Place in a large bowl, cover and leave to rise in a warm place until doubled in volume. Ours took a couple of hours; you can also leave in the fridge to rise more slowly overnight). Turn the dough out onto baking parchment and divide into 6 equal portions. 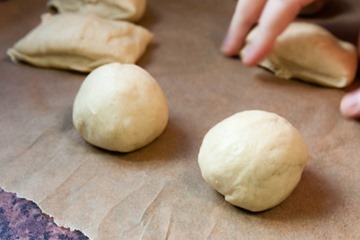 Roll into balls, flatten and cut a whole out from the centre of each one. We used an icing nozzle, as we didn’t have a suitably small cookie cutter. 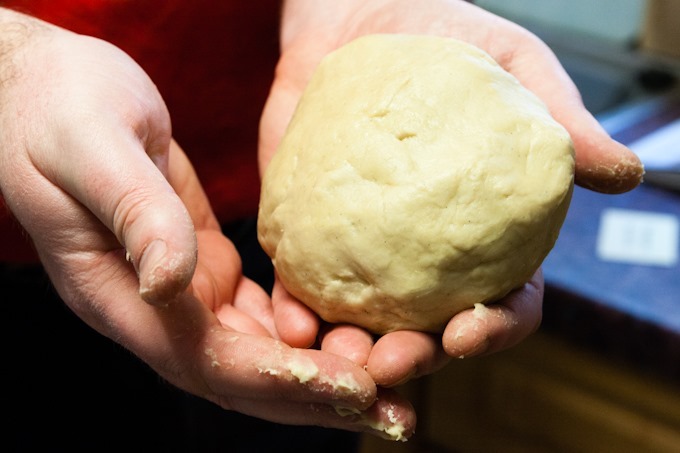 We also combined the dough from the four holes into two small round doughnuts. 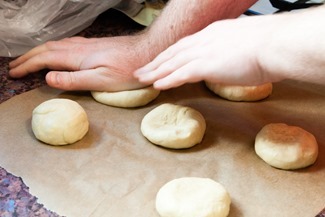 Cover with a clean cloth and allow to rise for 30 to 45 minutes or until doubled in size. 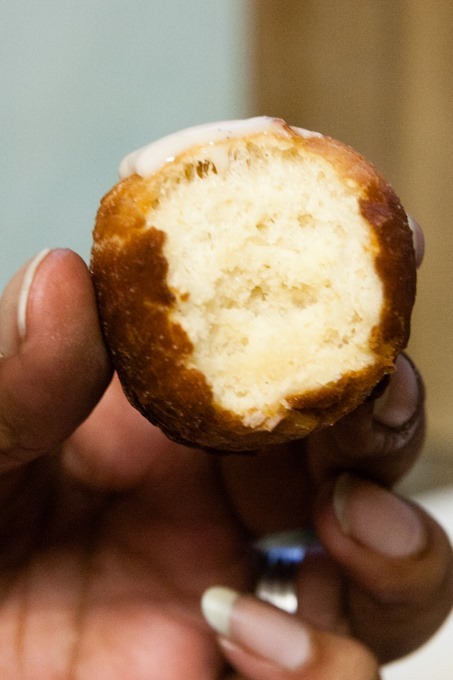 Make the glaze by whisking together the icing sugar, milk, salt and vanilla bean paste. Heat oil to about 180 C and fry doughnuts, in batches, until golden brown – about 2-3 minutes per side. 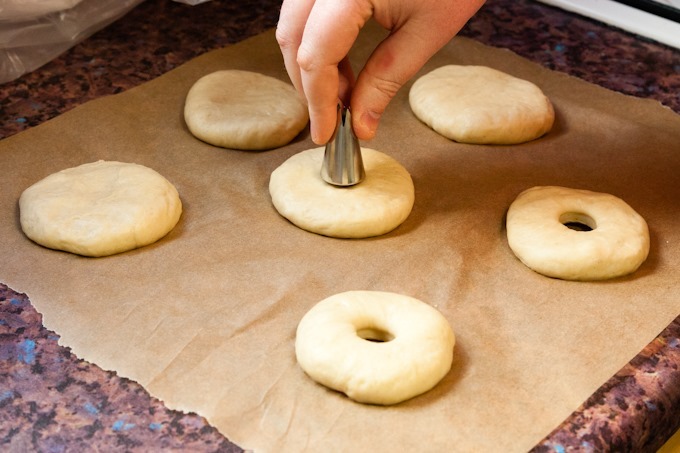 Sever warns against turning too often, as this can result in greasy doughnuts. 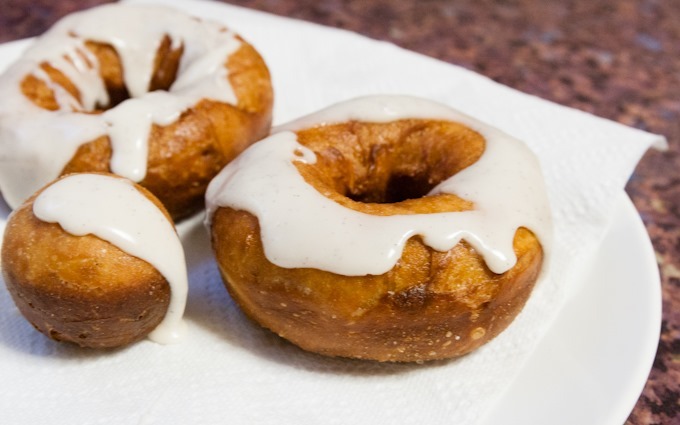 Spoon the glaze over the doughnuts whilst they are still warm, so it melts and trickles down the sides. With thanks to Quirk Books for the review copy of Pure Vanilla and to Judge Cookware for the multi basket deep fat fryer. 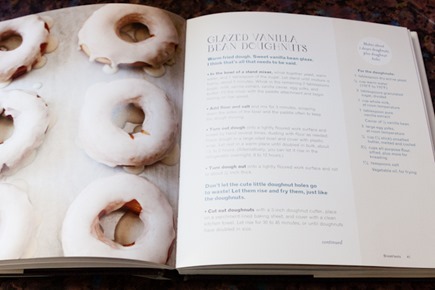 17 Comments to "Making Glazed Vanilla Bean Doughnuts + A Review of Pure Vanilla"
If I had a deep fryer, I’m not sure I’d ever be able to stop eating doughnuts! We figure we’ll only get it out every few weeks, fill it with oil, use it repeatedly until oil is ready to throw (about 4-6 times) and then put it away again! Now THOSE are doughnuts. I like mine heavy and cakey…not the raised holey kind. Sounds lovely. Always wanted a deep fryer, but really afraid of using it too often. Those look perfectly moist and light…yum! I’ve never seen a deep fryer with the basket having the handle and cooking from the long side and not the short (if you know what I mean). Make any difference? or just a different angle, so to speak? I’ve not used the type you describe, but I do like these handles, easy to keep the basket steady and attach it to the side to drain a little before removing. The lid stays up out of the way fairly well. There’s nothing better than the smell of donuts being cooked apart from that is eating hot fresh donuts, i have a deep fat fryer and you’ve made me want to give them a go. Do have a go, and let me know if you like them! I’ve deep fried occasionally in a deep pan but find it terrifying so don’t enjoy it / do it much. ooh I have been toying with making doughnuts for a while having had some lovely flavoured ones at the KERB doughnut stall at Kings Cross recently. (I had some sprinkled with cardamom sugar and with a salted caramel sauce which was rather yummy). 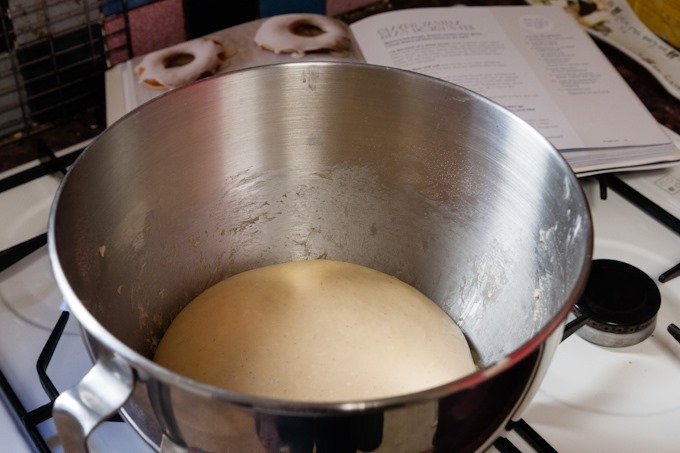 This entices me more though am thinking baked but perhaps it just wont be as good so will just have to decide bake/fry once I get my act together and make the dough! That sounds really good, with cardamom and salted caramel! Wow. 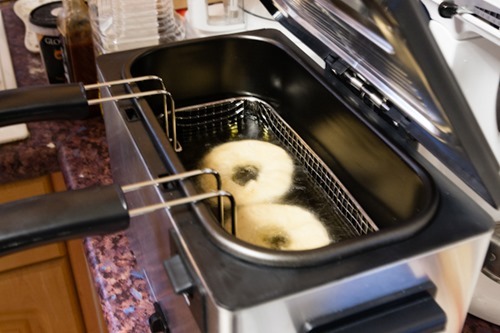 These look fab, if only I had a fat fryer…but they I would fry everything! Oh my! How did I miss this post?! I neeeeed a deep fat fryer in my house!